Will Qiqqa make me Smarta? Well, so far it hasn’t made me more clever – my apologies for that lame title…. 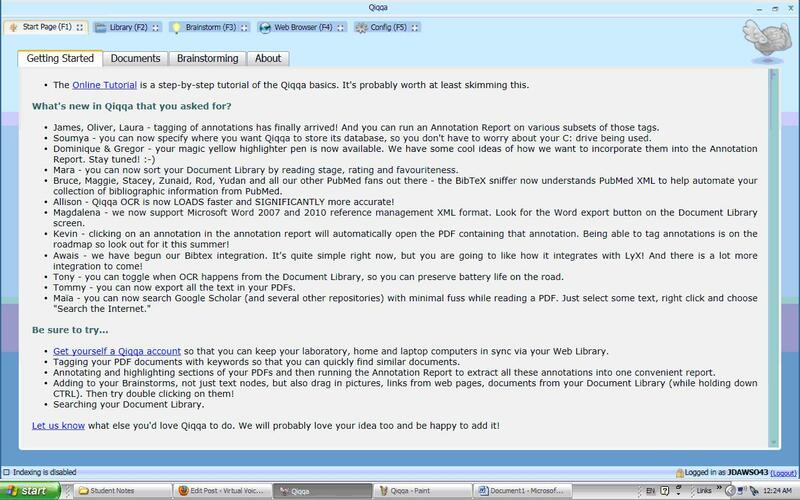 As an assignment in Digital History, I have been examining the pdf document manager Qiqqa. The first order of business was to determine how to pronounce the name. Fortunately, the Wikipedia page advised that it was to be pronounced “quicker.” I had trouble looking at the word Qiqqa and saying “Quicker,” but then I watched a tutorial that was led by a man with a British accent and I understood what was happening – Qiqqa is to be the British pronunciation of “Quicker” (ie. “Quick-ah”). Whew. With that aside, I was ready to tackle the program. I’m not sure about everyone else, but the transition to reading articles/journals/papers/blogs on the computer has been a long and painful one. During my undergrad, I generally printed off any online articles, grabbed my trusty three hole punch and highlighter and started reading. However, other times, I would read an article online and make notes on paper. That was problematic because my notes weren’t kept with the reading. In grad school, almost all of my readings can be found online and I just can’t justify spending the money (and wasting the trees) to print off all my readings, anymore. I’ve started saving all of the articles to my hard drive and making notes in a Word document. However, this is also difficult, because I’m constantly switching between the reading and the word document to make my notes. I told you. It’s been a long and painful process. That’s why I was anxious to try out a document manager for this assignment. Qiqqa looked very promising and I was willing to try anything that would remotely help me with this transition. To watch a tutorial on Qiqqa, you can visit the website – there is a video that highlights some of the features (it’s about 10 minutes long – might be Qiqqa than reading this never-ending blog). Qiqqa is still in its alpha phase, meaning that it is in test mode and this is the first version made available to the public. Right now, it is very easy to download a free version of Qiqqa from their website. They welcome feedback from users and when you open the program, the main welcome page actually highlights all of the changes they have made based on user feedback. It is very easy to get started with Qiqqa, thanks to a very clean and well organized interface. The first step is to add a document to the Qiqqa library. The pdf needs to be on your hard-drive, so this does feel slightly redundant. As you import your document, Qiqqa engages OCR (Optical Character Recognition) to recognize the text. OCR allows Qiqqa to identify the document’s metadata (author, title, year), create bookmarks based on headings in the article and it even allows Qiqqa to read the document out loud in a fairly scary robot voice. I think I will set this up on my front porch for Halloween to give the kids a good fright. As you read your pdf, you can highlight sections, make notes/annotations and add tags. Any tag that you add to a document (“Digital History,” “Archives,” eg) allows Qiqqa to index your library based on those tags. That way, not only can you sort your library by author, title and date, but you can sort it by the key ideas or main concepts you identified in the tag. You can also filter your documents by combining tags, so you can easily see, for example, all of the articles that discuss both “Archives” and “Public Memory.” Very cool. 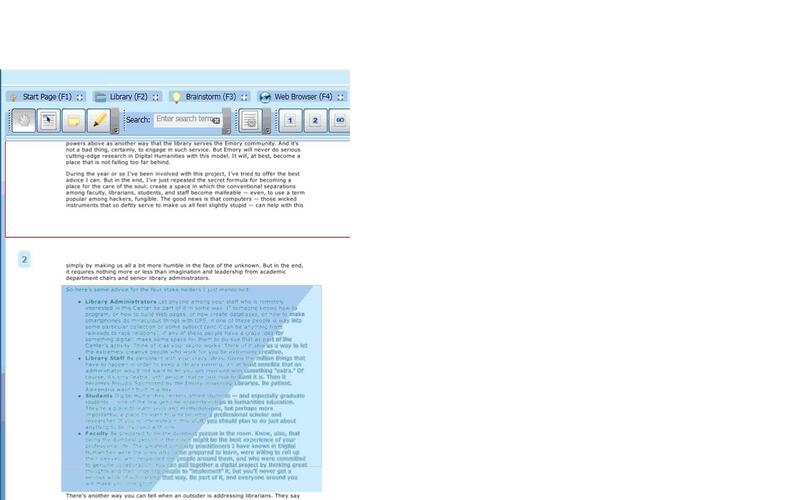 You can also run a report based on the notes or annotations you make as you read. You can choose to run an annotation report on your entire library, a particular article or based on any number of tags. Using the tag feature again comes in handy, as you will be able to see all of the notes you have made on a particular subject. When making annotations, you actually add your comments in a box over the relevant text, so the report will show the article’s title, the relevant text, your notes and any tags you have added. Clicking on the article’s text, will open the article for you (right to the page where you made your annotation). Qiqqa also has a brainstorm feature, which allows you to map out your ideas. You can add links, images and even documents from your library into your brainstorm. I haven’t spent much time with this feature, as I don’t generally brainstorm, but it seems like a good way to map out your thoughts or even organize a paper. Qiqqa also has a built in web browser, which allows you to type in a url or search a few different sources, like Google, GoogleScholar, Wikipedia and JSTOR, being the most applicable for me. You can also use the web browser to fill in the meta data of your document using BibTex, if the OCR didn’t quite get it right (which I found to be often). As much as I was impressed with Qiqqa, I didn’t see it solving all of my problems. What about all of the electronic documents that aren’t pdfs? What about webpages, blogs and online journals? I did a quick search in Google to see if there were any free programs that could convert my documents to pdf (I knew you could get versions of Adobe to convert documents, but I also knew they could be pretty expensive). Fortunately, there seem to be several websites that will do this for you. I chose this one and it worked perfectly! I converted a blog, saved in to my computer and imported it into Qiqqa, all within just a couple of minutes. I was very impressed to see that Qiqqa’s OCR worked even on this document (I tested the scary robot voice). – The program uses a fair amount of your system’s CPU. I don’t quite know what this is, but I know it slows down my computer and makes it extremely hot, causing me to be yet another victim of “toasted skin syndrome.” The CPU usage can be decreased by turning off the OCR feature, but I still find that it slows down my system a bit. – I haven’t quite been able to figure this one out yet, but Qiqqa keeps a copy of your document (with all of your notes), so that the original one is unchanged. Doesn’t this mean that there are two versions of each document somewhere on my computer and taking up space? – Although there are many ways to quickly sort your documents, there is no way to organize them into folders. This is a bit of a problem for me. Without folders, there isn’t a great way of keeping track of my weekly readings for class (short of giving them all tags like “Digital History Week 6,” which I guess will actually work). Maybe this isn’t a huge problem after all. I’ll keep you posted. – The annotations can be a bit distracting. At first, I was adding them in the margins, but when I ran the annotation report, I realized that the point was to put them directly over the relevant text. This can leave you with a giant blue (or pink, or yellow – Qiqqa lets you choose the colour!) text box over your article. Although it fades and your comments disappear once you move the cursor away, the blue box is pretty conspicuous. I don’t think any of these problems will be deal-breakers for me and I’m definitely going to give Qiqqa a decent chance. I will be sure to keep you all posted as I dig deepa with Qiqqa (sorry – I just can’t help doing that)! Qiqqa update #1 – I sent an email to Qiqqa (mostly to test their responsiveness) to request that the background on the annotations be lightened a bit, so they aren’t as distracting when reading the document. I just got an email back (3 day turnaround – pretty impressive) to say that my “wish will be granted” in the next release, anticipated in the next few weeks. I wonder what other wishes Qiqqa can grant…..
Oh, hello there! So far, I think this program would lend itself nicely to a large research project (even more so than keeping track of class readings). I’m not entirely sure what agricultural research looks like, but if there are lots of diagrams / pictures, etc, the annotation feature would be particularly helpful. Thanks for visiting! Not too crazy about the idea of heavy CU usage, or the fact that i may have multiple copies of the same documents all over my PC. I agree, Qiqqa seems neat! Great report, Joanna! I am happy you solved the mystery of its pronunciation. Is there a way to share your Qiqqa comments and documents online for others to see? Wow – thanks for a VERY COOL blog post about Qiqqa: it’s really encouraging when we get such great feedback from our growing Qiqqa community. Would you mind if we pointed back to your blog from our homepage? As I mentioned, we have an imminent release where you will not only get your lighter annotations, but you will see some awesome improvement in your CPU utilisation. And perhaps best of all, you might like our upcoming “group web library” functionality, where you will be able to share your PDFs, comments and annotations with your colleagues. Please keep the feedback coming. A most satisfying aspect of building Qiqqa is giving our community a research management tool that they really really want! PS: Hopefully we can grant ALL your Quick-ah wishes! Thanks for taking the time to read my blog (and for granting me my Qiqqa wish)! Feel free to share my review with others. I have only been using the program for a couple of weeks, but as I said, am pleased with it so far and will definitely use it for awhile to see if I can fully integrate it into my daily work. I’m looking forward to the new release. The collaboration features that you mention seem particularly interesting and I suspect there will be a demand for such functionality. Thanks again for visiting and for being so responsive! P.S. – I feared that I didn’t get the accent quite right, so my apologies. In my defense, I am absolutely awful at identifying accents / dialects! Nice review. You really sold me on the idea of Qiqqa since I also find it difficult to justify printing off articles but miss the interactivity of making notes in margins. Also, it’s pretty neat watching your interactions with the Qiqqa folks – the digital world in action, sweet! I enjoy this post. Informative and charmingly humourous. At first I thought, this Qiqqa program will not help me since the articles I want to read are not on my computer’s hard drive. However, I decided to continue reading and was pleased to discover you had done the research and found a method of transforming these online texts to pdfs. Thank you. I have yet to try this, but I’m encouraged to do so. One of the major reasons that I hesitate to read digital text is because I cannot make annotations right on the document the way I can with a paper copy. Perhaps Qiqqa or something like it will be the answer for me. Thank you also for referencing toasted skin syndrome. I just talked to some of my students about it the other day. I guarantee some of them have it. Keep up the great work! I really like that this Web Tool is designed for personal use and not for group uses (like the Mendeley one also discussed today.) I’m always hesitant about any website/program that claims to be a free place to upload your documents to share with other people … I just have this feeling that my documents are being observed and possibly taken over because of something I missed in the small print. Like you discussed in class, I think creating a library and then using the tagging method for sorting documents is a great approach. It lets you see themes that perhaps you wouldn’t have seen if our class readings were sorted only by week. I wish we had discussed this tool during the first week of class. It may have come in handy for the duration of the course. But heeding your advice about the overheating, I’m thinking that my 5 year old laptop wouldn’t be able to handle this Web Tool. Just got the new Qiqqa release – stay tuned to hear about its updates!